Enlarge This model is made for the UcD180 modules. The SMPS400 is a high efficiency Safety Class 2 switch mode power supply specifically designed for use with our range of UcD®amplifier modules. Key features are high efficiency over the entire load range, extremely small form factor, low weight and very low radiated and conducted EMI. The SMPS400 also features an advanced over current protection which in case of temporary overload simply reduces the output voltage, only when the overload condition remains for a longer time the supply will enter hiccup mode until the overload condition disappears. 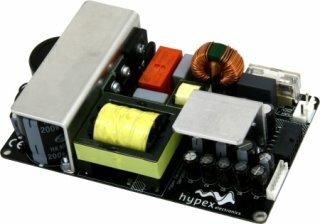 This feature combined with large electrolytic buffer capacitors leads to the capability of delivering high dynamic headroom power to the connected amplifier. The SMPS400 also includes an auxiliary isolated supply and a control circuit directly interfacing with our range of (OEM and standard) UcD®amplifier modules. The supply is triggered for normal operation or latched off in case of a critical fault via in built-in actuators. The SMPS400 is optimized from the first phase of design to final implementation to realize the low EMI signature required of the most demanding audio applications. Enlarge This model is made for the UcD400 modules. Enlarge This model is made for the NC400 module. 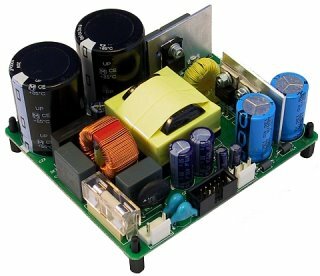 The SMPS600 Power Supply is a 600W high efficiency switch mode power supply specially designed to be used in combination with our NCore™ amplifier modules. Cable set and mounting set included. 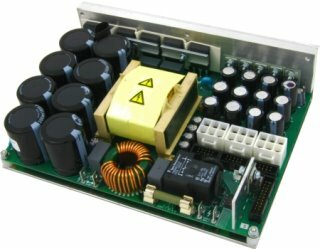 The SMPS1200 is a high efficiency Safety Class 2 switch mode power supply specifically designed for use with our range of UcD™ amplifier modules. Key features are high efficiency over the entire load range, extremely small form factor, low weight and very low radiated and conducted EMI. The SMPS1200 also features an advanced over current protection which in case of temporary overload limits the output current, only when the overload condition remains for a longer time the supply will enter hiccup mode until the overload condition disappears. 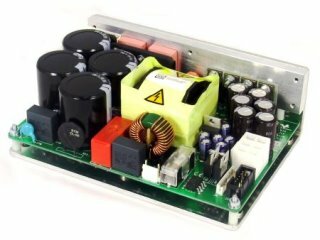 This feature combined with large primary electrolytic buffer capacitors leads to the capability of delivering high dynamic headroom power to the connected amplifier. The SMPS1200 also includes an auxiliary isolated supply and a control circuit directly interfacing with our range of (OEM and standard) UcD™ amplifier modules. The supply is triggered for normal operation or latched off in case of critical fault via in built-in actuators. The SMPS1200 is optimized from the first phase of design to final implementation to realize the lowest possible EMI signature required of the most demanding audio applications. Enlarge This model is made for the UcD700 modules. Enlarge This model is made for the UcD700 and the UcD2k modules. The SMPS3K is a high efficiency Safety Class 1 switch mode power supply specifically designed for use with our range of UcD® amplifier modules. Key features are high efficiency over the entire load range, extremely small form factor, low weight and very low radiated and conducted EMI. The SMPS3K also features an advanced over current protection which in case of temporary overload limits the output current, only when the overload condition remains for a longer time the supply will enter hiccup mode until the overload condition disappears. This feature combined with large primary electrolytic buffer capacitors leads to the capability of delivering high dynamic headroom power to the connected amplifier. 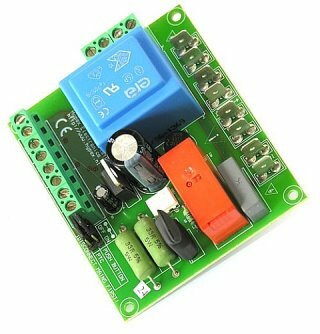 The SMPS3K also includes an auxiliary isolated ±23V supply and a control circuit directly interfacing with our range of (OEM and standard) UcD® amplifier modules. The supply is triggered for normal operation or latched off in case of critical fault via in built-in actuators. The SMPS3K is optimized from the first phase of design to final implementation to realize the lowest possible EMI signature required of the most demanding audio applications. Enlarge Softstart module to minimize transformer inrush currents and provide for push button control at the same time. Temperature critical applications can be monitored with a thermistor (PTC not included). Module state can be indicated with one or two LED's (LED not included).